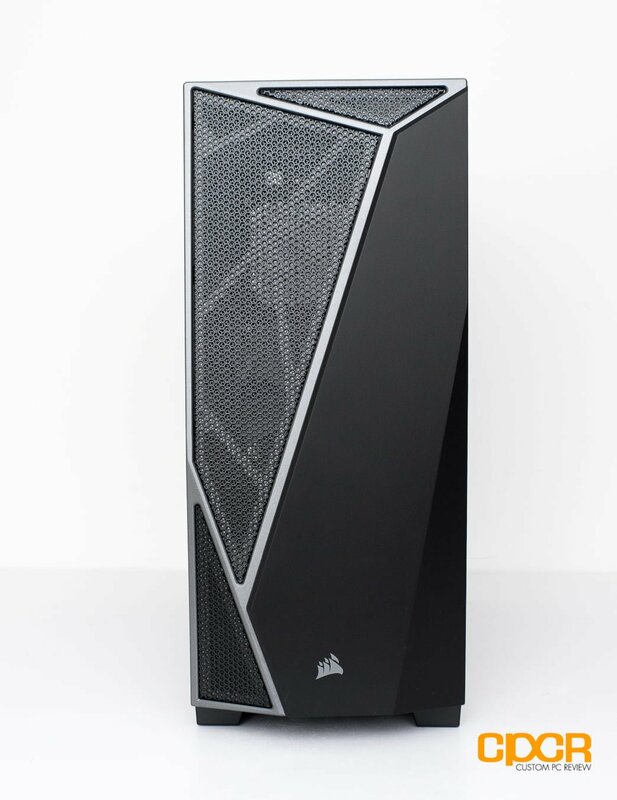 For our review today, we received the Corsair Carbide SPEC-04 in black however, it will also come in red and yellow as well. Corsair’s Carbide SPEC case series has always had the design language that screamed gaming, but the fourth iteration of the series, the SPEC-04, is quite a bit different. Whereas previous generation SPEC series cases featured an ultra-aggressive design, the new SPEC-04 features a design that’s a bit more subtle and more mature than its predecessors. The SPEC-04 is embellished with an angular front cover. Featuring a hybrid of mesh and plastic plate separated by silver cutouts, the design looks appealing without obstructing air intake. The dual-layered mesh is quite fine and should do a decent job at keeping out dust. While the side placement of the front I/O prevents them from blemishing the flush look, it also means all connected peripherals will stick out and prone to damage.The reset button is recessed to protect it from accidental presses. The rear of the case is without frills. Seven PCIe slot covers are mounted on a right-angled plate. 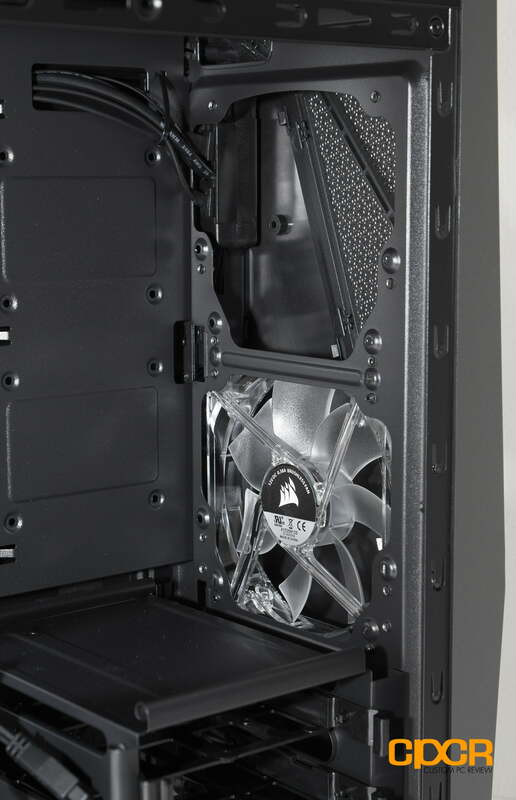 A single 120mm fan mount is available for a rear fan. Removing the tinted acrylic side panel reveals the spacious-looking interior. In times past, painted interiors are reserved for high-end cases, in today’s case market, it’s pretty much a staple for cases of any price range. Motherboard standoffs are installed for the ATX form factor and numerous cutouts are available for cable routing. The narrow spacing between the back panel and the motherboard mount plate is worrying. 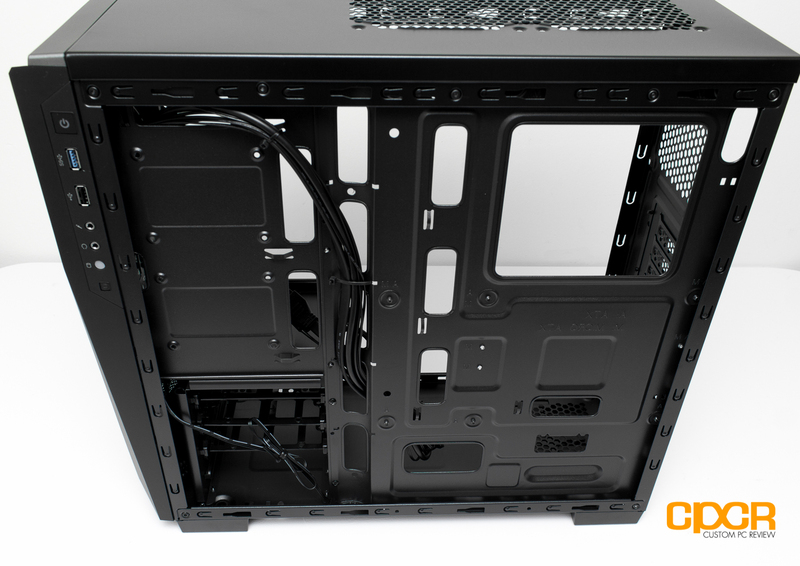 Many power supplies, especially ones that are not modular, require ample room to hide away thick cables. The drive cage holds three 3.5″ HDDs. The brackets are traditional snap-in brackets and are not padded to dampen noise. 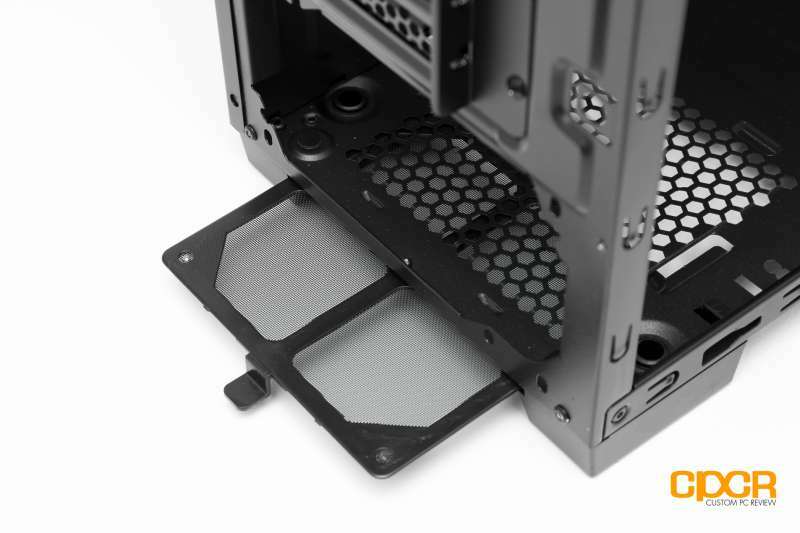 The sides of the case also has mounting points for two 2.5″ SSDs. They’re meant to be mounted vertically onto the case so no 2.5″ SSD adapter or tray are included. A single 120mm intake fan is included with room for another. A finely-meshed dust filter is placed under the power supply intake vent. It can be easily pulled out for cleaning. The Carbide SPEC-04 was relatively workable: the commodious interior didn’t cause any trouble for my hands and easily fit all the components without a hitch. I used a short XFX Radeon 7850 for demo purposes, but there’s lots of room left for longer cards. Ample routing cutouts made pulling cables through easy. One thing I disliked is how difficult it was to remove the front panel. 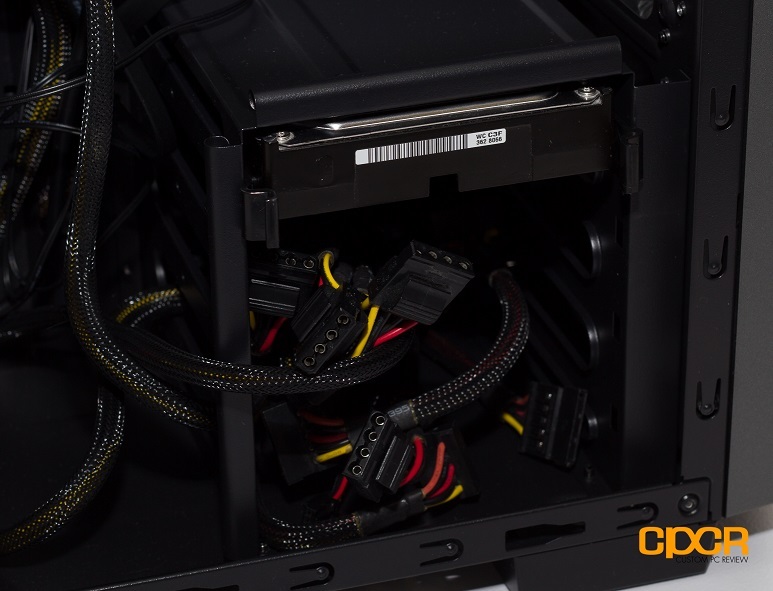 Corsair utilizes one-way pin tabs (think the plastic holders on Intel’s coolers) holding it in place and they were a massive pain to push out. Luckily, it’s not something most users have to access very often. With the SPEC-04, there’s no 5.25″ drive bays, but the absence of the legacy drives bays didn’t bother me all that much. In fact, I can’t even recall the last time I had to use an optical drive. Nonetheless, if that’s something you need, it may be an issue worth thinking about. Another nuance is the lack of a cutout at the top for routing the 4/8-pin CPU power cable. This means that no matter what you do, you’ll always have a cable crossing your view. The ceiling of the case is also extremely low relative to the motherboard. If you have a fan or radiator mounted at the top, it may bump into the 4/8-pin CPU power cable. Cable management is, unfortunately, a bit difficult. If you’re like me and don’t want to spend a great deal of time arranging all the cables so the side panel can close correctly, it can be stuffed into the unused space under your drive bay. 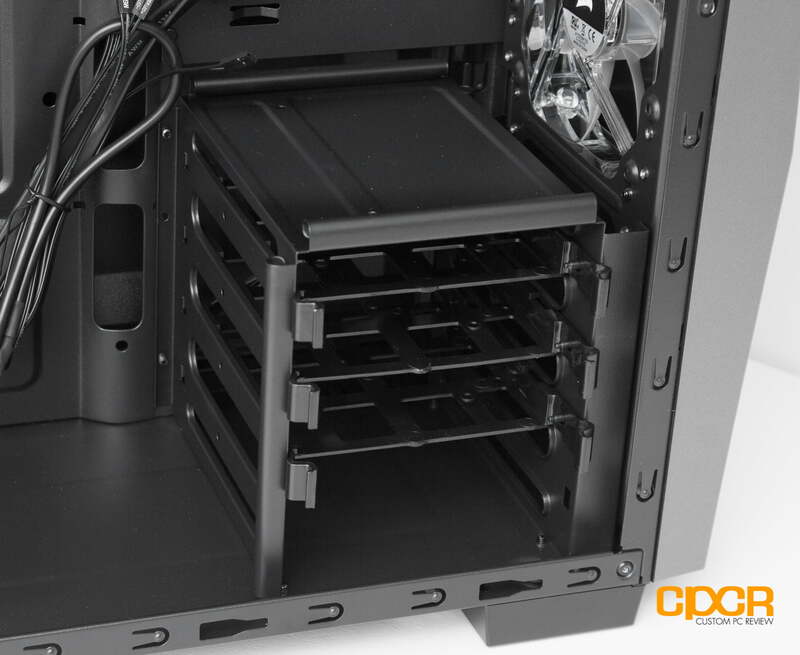 Users with multiple drives would have to push the extra cables elsewhere or commit to some intense cable management. For a case like this, I’d definitely recommend picking up a modular power supply to reduce the amount of cables. Simple, pragmatic, and well-priced, the Corsair Carbide SPEC-04 is a good fit for gamers on a budget. Unlike its predecessors, its sharp angles are equally appealing in the office as it is in the game room. Top it off with the contrasting luster from its silver accents and the SPEC-04 achieves a respectable blend of sophistication despite the reasonable pricetag. Speaking of impressive, it was impressive to see some of the features Corsair was able to cram into the SPEC-04. 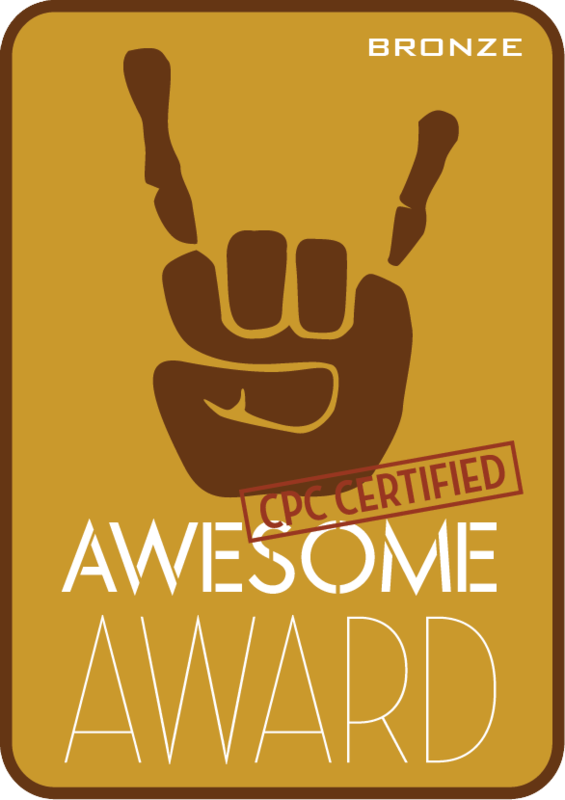 For example, it features a durable frame that can easily handle a a full load of components. Both the interior and exterior are also well made and nowhere on the case shows signs of bad craftsmanship. This gives the case a much higher end feel despite the budget price. 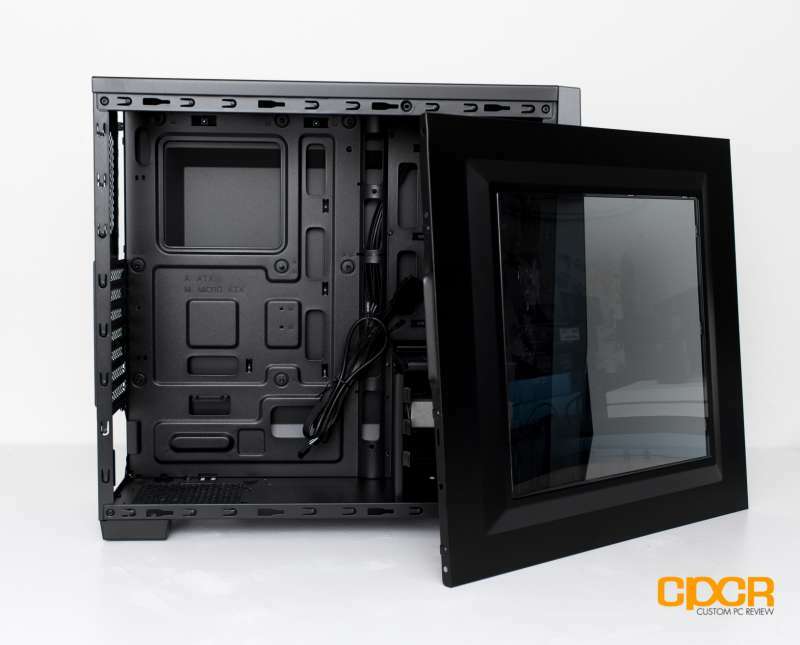 With the SPEC-04, Corsair was also able to equip the case with a smoke-tinted side window which will allow showing off your expensive components. Unfortunately, where the case cut corners is also palpable. The ceiling of the case is a bit flimsy and flexes heavily under moderate pressure. The sidepanels are also quite thin, which is typical of more inexpensive cases. There’s also no included 5.2″ drive bays, so internal optical drives are out of the question. 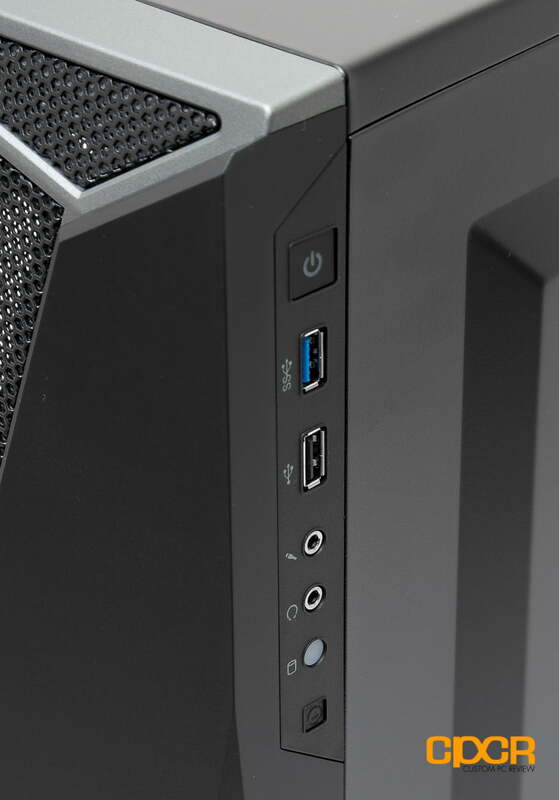 It’s also interesting to note that although both USB ports on the front panel connect to a USB 3.0 header, only one is USB 3.0. Build experience with Corsair Carbide SPEC-04 can wildly vary depending on the person. 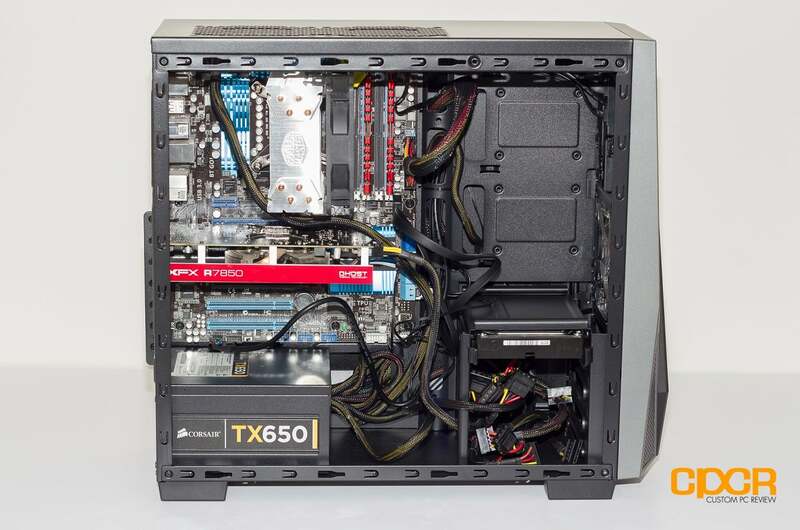 If cable management is a concern, the area under the motherboard tray doesn’t leave much room to store unused cables. Unless you have a modular power supply or ample of patience, you’ll have to leave some cable in plain sight. 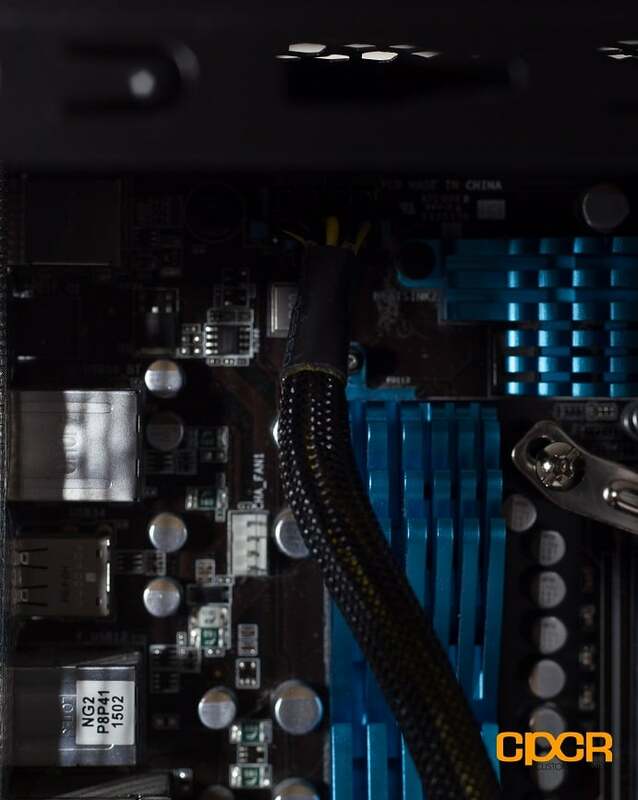 If your CPU power connector is located at the top of the motherboard, then you’ll have to run the wire from the front. 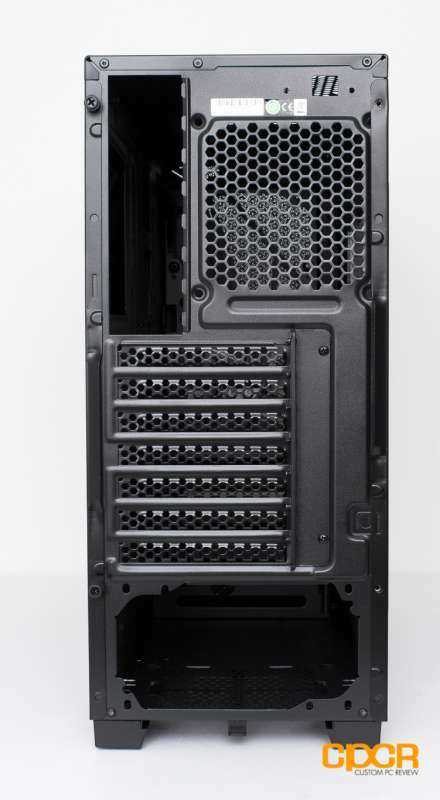 The motherboard also sits extremely close to the top of the case, so installing a fat radiator in the top vent may not be viable. The compromises are understood once the price is factored in. For just $50, this level of quality and features are more than acceptable. 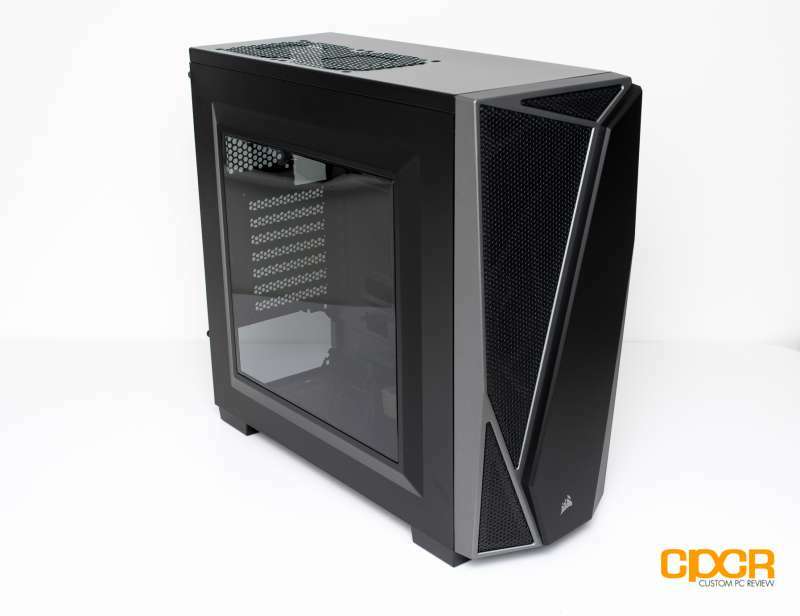 If you’re on the lookout for a decent, reasonably priced case and are willing to put up with some of the shortcomings of the case, definitely check out the Carbide SPEC-04.